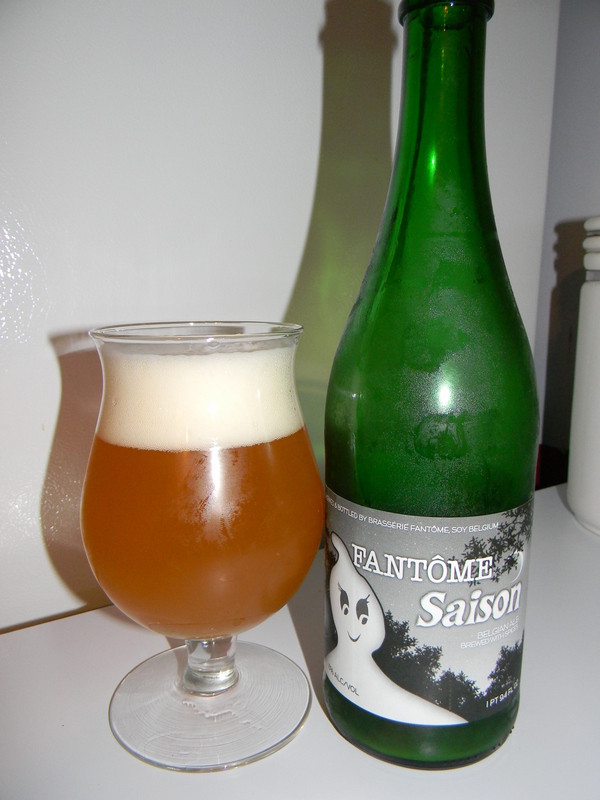 Review of Fantome Saison | Beer Apprentice - Craft Beer News, Reviews, Interviews and Info. How’s it going guys? I hope you are ready for a craft beer review. Today, I’m going to be having another beer from one of my favorite brewers… Mr. Dany Prignon. The brew is his flagship Fantome Saison made in Soy, Belgium. No small talk here. Let’s get to the website, fantome.be, and see if we can find some info on it. Like all Fantome products that I’ve tried so far, this one comes in a 25.4 oz. bottle and it has an ABV of 8.0%. It poured a hazy, orange to yellow color with a white head. The cap was sized very well. The texture was soapy, soft and foamy and as it settled it became very smooth. The retention time was great and the lacing was choice. Very attractive to say the least. The bouquet produced some beautiful floral notes with somewhat of a sweet character. Tones of fresh pear, clean breads and freshly cut grasses. The yeast and the funk were noticed, however neither were extremely robust. It smelled more “fresh” and “new” than funky, stale or musty…. and that wasn’t a bad thing. It seemed to be a lot more harmonized and balanced in that regard. Nice. Not that I don’t appreciate and love the extreme funk that these beers tend to have, but it was nice to experience a slightly different take. The flavor released those fresh grassy hops too, which gave it a modest amount of bitterness. Very floral with some more of that “not quite ripe” pear. The savor was semi-tart with just a tad bit of lemon. The funk was relaxed, but very well integrated. Little to no peppery spice, however a sturdy yeast was tasted. Wonderful. The mouthfeel was medium bodied. Smooth, but crisp, and dry. Refreshing and thirst quenching as well. The carbonation was lively and vibrant, yet not stingy. It seemed to just tickle the tongue ever so slightly. An outstanding dose of flavor was left behind on the palate after each sip. Well, Fantome never disappoints. This Saison has become one of my staples even though it is, to some degree, different than most Saisons that are out there. I realize that the recipe may change a bit from time to time, but it never let’s me down. I’m always satisfied. The spectacular drinkability makes this a killer Spring/Summer brew. One that I would highly recommend if you can obtain a bottle. Have you guys ever tried the Fantome Saison? What did you think of it? I’d really be interested in hearing another opinion.